Ok I haven’t defeated the 7th evil ex yet, but I have had plenty of play with this to tell you guys not to miss out on this. 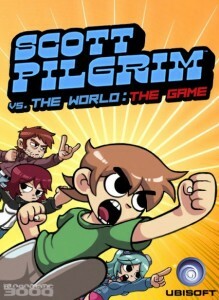 Recently released on the Playstation Network and Xbox Live is the new 2D side scroller arcade game based on the graphic novel and movie Scott Pilgrim vs. The World. Now let me start off by saying I am a fan of the comics and the the movie so this was a real treat for me. However you don’t need to be a fan to love this game. 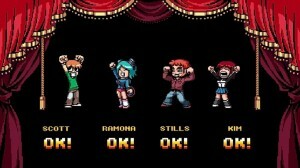 Scott Pilgrim is a throw back to the old school arcade style figting games. Good ol’ fashion fighting in the streets, grabbing objects for weapons, and throwing them at your enemys. Anyone who played anything like Final Fight or Streets of Rage will get a feeling of nostalgia. Throughout the game you collect change that the bad guys drop which can be used to buy items for healing or upgrading your stat line. Also as you play you will see tons of little details which pay homage as well as poke fun at video games in general. 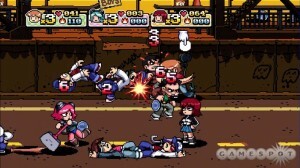 And nothing is more fun than experiencing all of this with 3 of your friends, as the game supports a 4 player co-op with 4 characters to choose from. Now while this game is really fun and addicting it has a few annoyances. The big one is the fact that the co-op is not over Xbox Live or the Playstation Network. It has to be played off one system with all your buddies crowded around the TV (however, it does bring out the old school feel since we didn’t have online multiplayer for games like this in the glory days). Another problem we ran into was throwing objects. While it’s an effective way to keep your enemys at range, it can also be your allies worst nightmare. I say this because while you cannot punch or kick your allies, you can accidentally chuck a baseball bat into the back of their head causing them damage. Or if you miss everyone completely, you have the chance of the item hitting the wall and bouncing back at you (which hurts). Another issue is one of the moves you unlock during gameplay. The grapple. Again effective to throw enemies, but done wrong you can be tossing you friend instead. Now honestly all those problems can be fixed with a patch and I hope they do it. Online co-op would be a great move. This game brought hours of fun and laughs for me and my friends. I would highly recommend getting this. Even if you just download the demo (which is the entire first level) you will get hooked. Even after beating this I see a few trips back to try other characters and show it off to other friends. 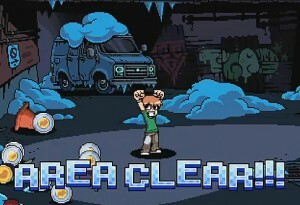 So I give Scott Pilgrim vs The World Game a rating of 8/10 with a moderate replay value. This game stays true to the 2D, so you have to be lined up (left to right or right to left) to hit your enimies. Man I remember playing so many of these side scrollers when I was younger yet for some reason the names of them escape me. You mentioned that throwing objects can bounce off walls and hurt your friends and enemies I actually think this is actually more of a cool features then a bug. It makes you think about where you throw things. Now when you throw things can you throw them in 360 degrees or do you have to line up with them? I most of the old scrollers you could move up and down or you could move left and right… do you have full 360 movement? I am mildly confused why they didn’t add the multiplayer aspect to the game. While some people still play in groups it doesn’t happen near as much as it used to.